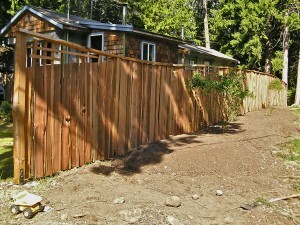 Another great local hand split cedar fencing project came my way this year. 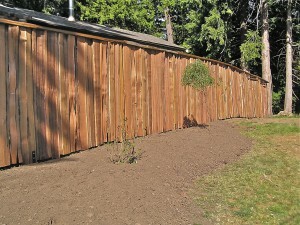 This fence is made entirely from reclaimed and salvaged old growth red cedar. I started by putting in the post saddles. For the first time ever I had the help of post hole digger on a bobcat, which I must say really speeds things up, and makes a nice neat round hole for the most part. The holes are 2′ deep here as we have little ground freezing in the winter. They are filled with concrete and have metal saddles set into them (the saddles sit 8″ into the concrete and stick up 8″ above the ground) which help keep the bottom of the posts a couple inches off the ground. 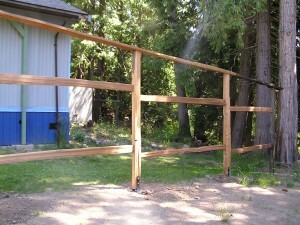 Once I have salvaged all the wood I needed for the project, I split the cedar with my froe into the posts, rails, caps and grapestakes that will make up the fence. The posts are then bolted to the metal saddles, and fitted with rails, each rail custom fitted to the post and notched then screwed with 4″ screws. Then the cap goes on, in this fence it has a gentle curve following the ground up over a small hill. 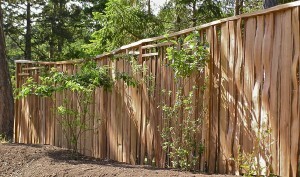 The fence boards of varying widths (called grapestakes) are attached with spiral galvinized nails. 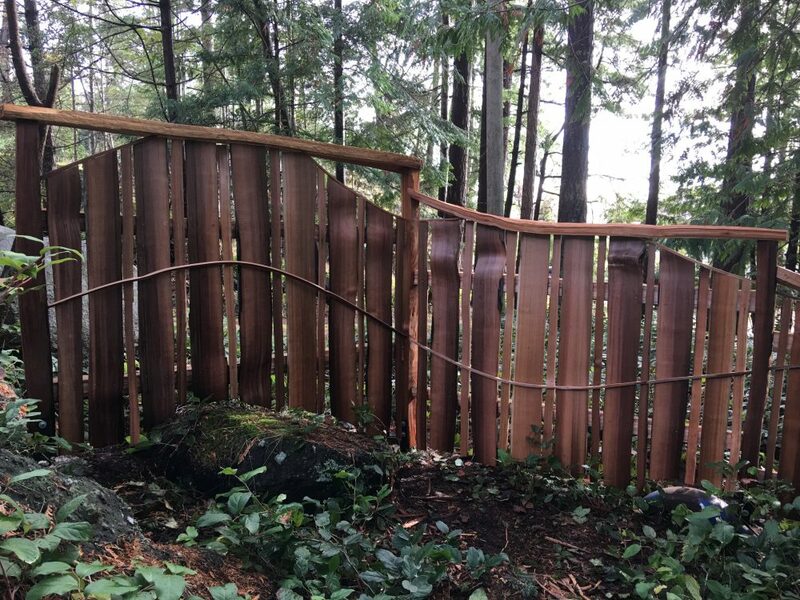 I often make patterns with the fence boards, and in this project left some areas high on the fence with lattice, for future vines to cling to, and only in areas that are not in need of as much privacy from a more solid fence. 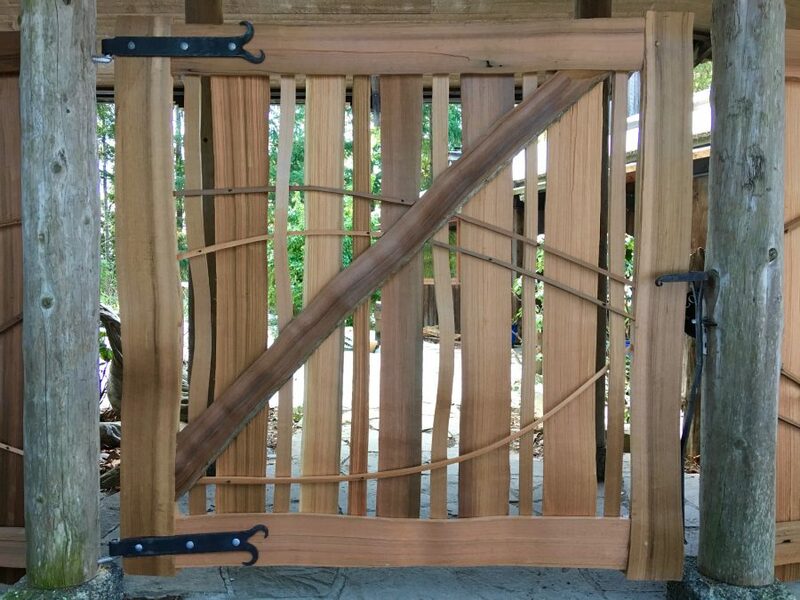 All in all a very suitable rustic island fence with much character, and made with long lasting design and materials.